The dysfunctional temporomandibular joint is a notoriously poorly managed condition that is characterised by a variety of symptoms, including jaw and face pain, headache, ear symptoms, tooth ache, and poor sleep patterns. An acute TMJ dysfunction may occur following dental work such as wisdom teeth removal, following an excessive opening injury such as biting into a large apple, following a local impact injury resulting in pain and swelling, or due to biomechanical dysfunction following fixation due to a jaw fracture or a new set of dentures. Chronic TMJ dysfunction can occur due to postural influences (chronic bruxism, forward head posture), due to biomechanical changes following whip lash injuries (muscle length changes around the head and neck), or due to gradual biomechanical changes related to changes in occlusal pattern (braces, tooth removal, capping). Chronic TMJ dysfunction is almost always associated with an upper cervical joint dysfunction with associated muscle and neural mobility changes. 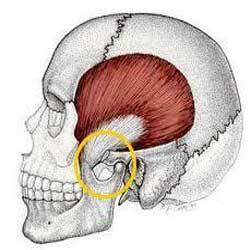 The Physiotherapist assesses the TMJ as they would any other dysfunctional joint in the body. The joint is palpated, the range of motion is assessed, and muscle function around the jaw, head and neck is also assessed. The cervical spine must also be assessed specifically as due to the close association of the structures, the TMJ and cervical spine function do influence each other. Biomechanical faults are noted, limitations or excessive ranges are examined, and a plan of treatment and rehabilitation is developed. Symptoms are varied and can include headaches, jaw pain, tenderness of the occlusal muscle groups, upper cervical spine pain, poor sleep patterns, blocked ear, and difficulty eating some food groups. Sometimes the patient has high stress levels that may need to be addressed to decrease bruxism and improve sleep patterns. The physiotherapist will enlist the assistance of the GP in these circumstances. Bruxism can also be alleviated with the addition of a suitable night splint, and referral to a dentist specialised in this area may be required. Generally speaking, a hypo-mobile joint is mobilised, and a hyper-mobile joint is stabilised. Obviously it is not quite this simple, but treatment may include mobilisations to the TMJ directly and the cervical spine facet joints, appropriate muscle exercises to strengthen and re-coordinate the jaw function, relaxation exercises to take pressure off the occlusal muscles, trigger point treatment and releases, and the Rocabado program of rehabilitation for TMJ dysfunction. Link to downloadable copy of this information.